We had so much fun with Jann Cheifitz of Lucky Fish at our Print Workshop at the shop! 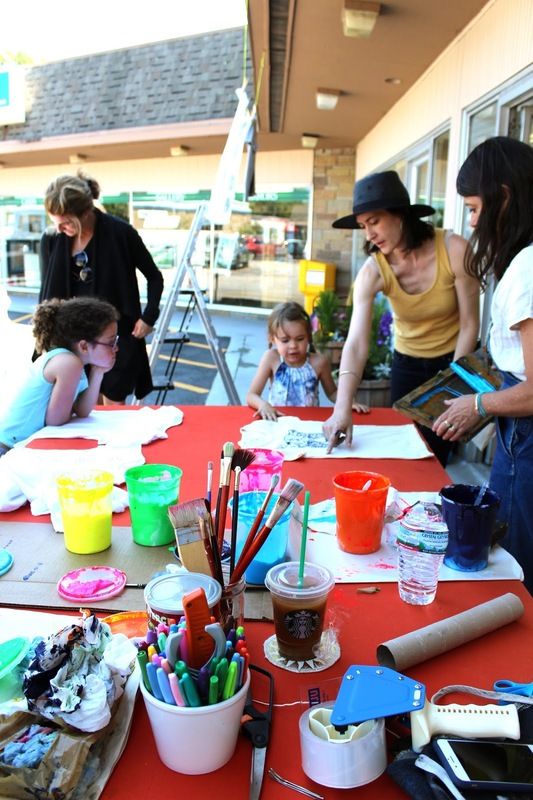 It was a beautiful day and we set up tables outside in front of the store and got out the printing tools! What F U N, and as a side note it was SO much fun we are doing it again, printing, laughing and being creative all together. We thought people would need t-shirts from us but most brought old t-shirts to UP CYCLE! We all printed on the clothes we were wearing and more... it was a real day of creation. Some of our favorite results came from printing on the clothes we were wearing, I printed a few on my favorite Layla kurta! and we even got some skirt prints.. it was a blast! The older kids got into the action and pulled out their Jackson Pollock... They splatter painted all over their T's and made some great works of their own! We made scarves, pillows, and whatever came out of the bag! Next time we want to see you HERE at the Lucky Fish PRINT WORKSHOP! get your best BEACH on! !